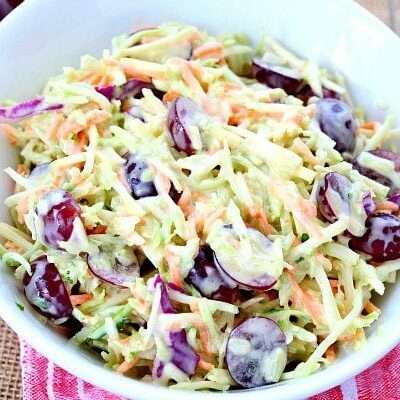 This Fruity Curry Chicken Salad recipe is just the thing to serve for a light dinner or lunch. 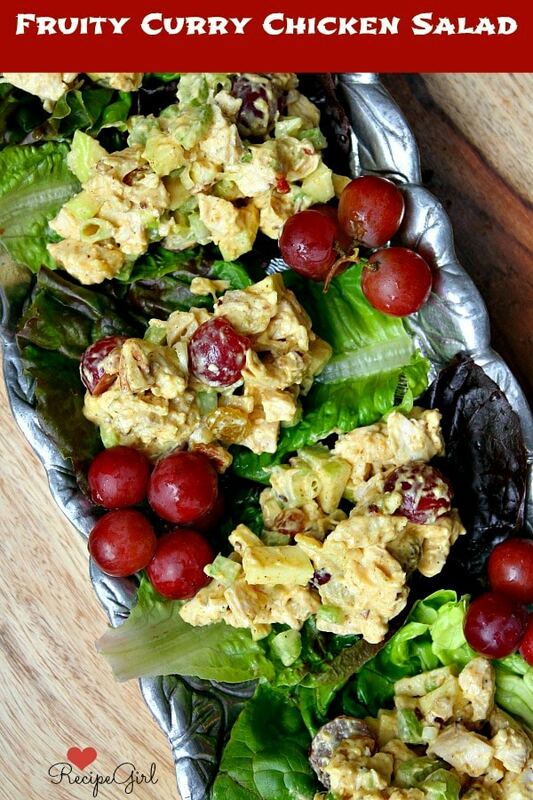 Bring it along on a picnic, or feature this curry chicken salad at a tailgate party too! 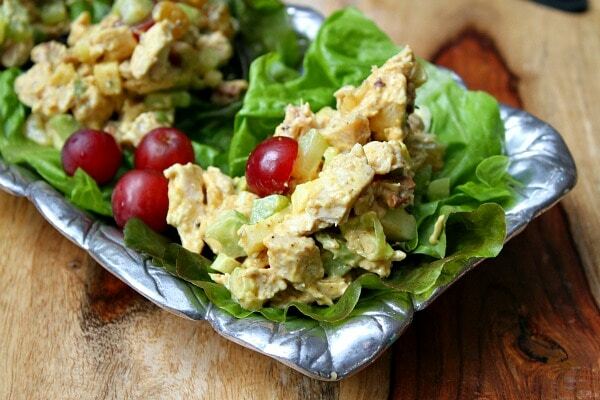 Curry chicken salad is one of those kinds of recipes that you might think you DO NOT LIKE. Think again. This recipe has just a touch of curry in it. 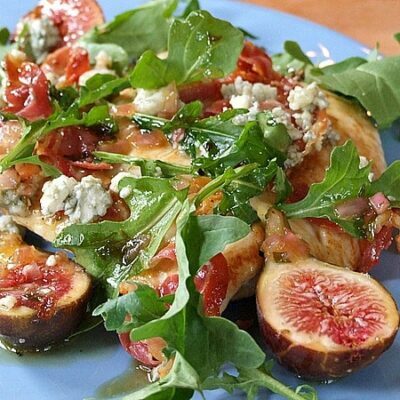 It’s not overwhelming, and it’s the perfect light dressing to coat the fabulous ingredients that make up the salad. 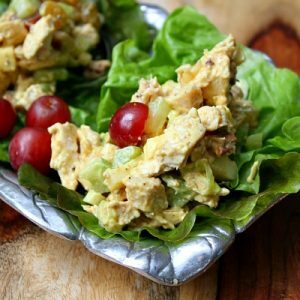 A friend of mine gave me this Fruity Curry Chicken Salad recipe when we were living back in Reno. It was a hit with her family, and it has always been a hit with mine as well. This is all of the good stuff it has in it. You’ll see plenty of sweet fruit- golden raisins, apples and crushed pineapple. And there’s a good deal of crunch in the salad too with added celery and toasted pecans. I’m sure you can pick and choose and substitute a little bit here and there if all of the ingredients don’t suite your taste. I serve this curry chicken salad a couple of ways at my house. The girls in the house usually choose to spoon it over lettuce leaves and eat it as you would lettuce wraps. The boys prefer to tuck it in between two bread slices or inside a pita and call it a sandwich. Either way… YUM. It’s crunchy and fruity, and it has some really nice flavors going on. Leftovers are always great for a couple of days too. Place salad ingredients in a medium bowl. In a separate bowl, whisk together the dressing ingredients. Add the dressing to the salad and mix well. Chill until ready to serve (or serve immediately). Scoop onto lettuce leaves for serving. The chicken salad may also be spread between two slices of bread or onto a croissant and served as a sandwich. If you are preparing this recipe as gluten-free, just make sure you use brands of canned pineapple, mayonnaise and soy sauce that are known to be gluten free. 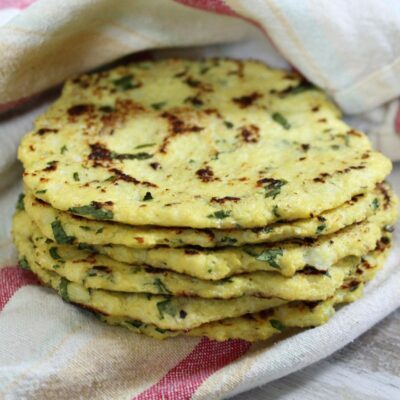 Serve on lettuce leaves or gluten-free bread. I just made the chicken salad and tasting before chilling I know that it’s going to be good. Mmmm. Mmmm. ???? 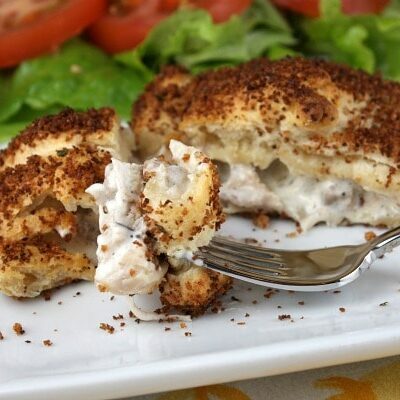 I’ve made this SO many times with your recipe- we’re not big mayo fans, so I just sub in Greek yogurt- still works like a charm and so delicious. Thanks for this- it’s part of our regular rotation these days. What a great mix- thanks! Wow, this is absolutely delicious!! Thanks for my new favorite chicken salad recipe! This sounds awesome! 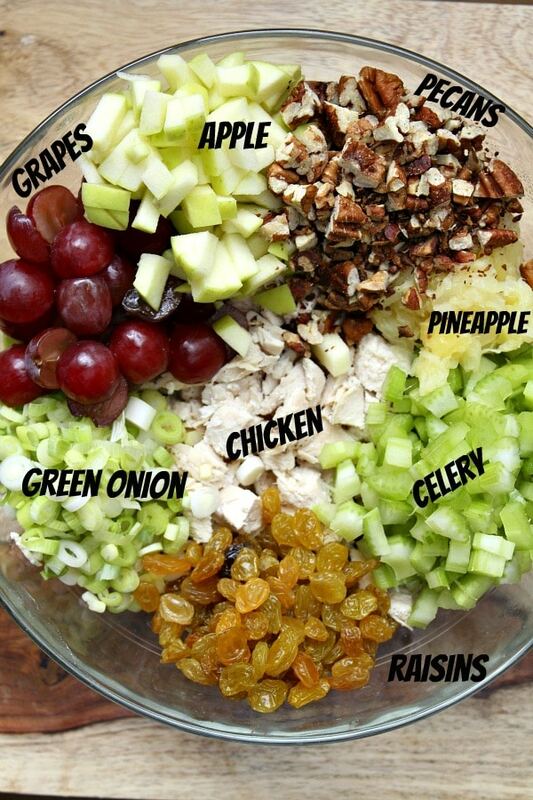 I’ve been wanting a way to mix up my chicken salad so I’m definitely going to try this! Love the additions of pineapple and soy sauce! I made this today, WHOA is it good! I doubled the recipe and taking it to the salon for my coworkers this week for lunch. They’re gonna love me! awesome! Glad to hear it was a success! Ohmahgosh! 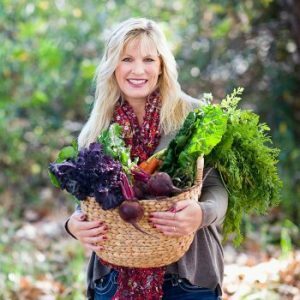 LOVE this killer salad recipe, Lori! Be sure to thank Kristen for sharing so you could share with all your readers. This is a must-make-asap recipe. In fact, I think I’ll make it as our salad for this Labor Day weekend. Once again, thank you for sharing! Of course…will pin everywhere! Wow, my realtor only gave me a photo, I want recipes!!! Ha!! And I love your shirt, so cute. And who doesn’t love a good chicken salad with grapes!! Now, this is my kind of chicken salad! Love the curry and golden raisins! 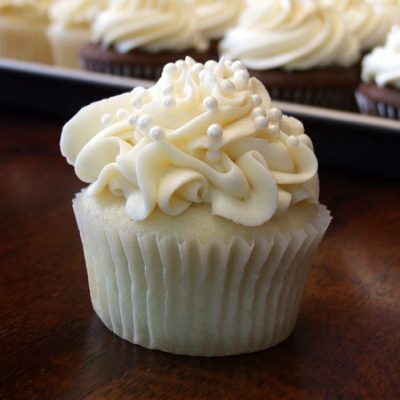 This recipe is so great! Totally making it.. Love the curry with the chicken and fruit…and the crushed pineapple? SO great! Also, such a crazy story about how/why you guys moved! I love it! Loving all the sweet and crunchy ingredients in this chicken salad!! Wow, you have one awesome realtor! 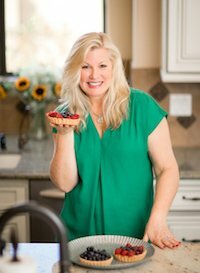 She finds your awesome house and recipes. Lucky! Lol! What a great salad! It is perfect for the last few weeks of summer and I love anything with some fruit and curry!